Description This intergenerational drama is set in a sumptuously furnished dining room. A young soldier, his injured left arm in a sling, his boots and trousers mud-spattered, and sword and gloves flung on the carpet, has just returned from service in the Mexican War. Gesturing expansively toward the Revolutionary portrait, he seeks approval from his older relative, who appears lost in memory. 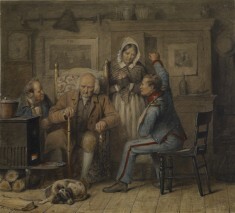 Other family members, presumably the soldier's parents and sister, dressed in the fashion of the moment, listen with concern. In the doorway to the right, three African American house servants attend to the conversation. Old '76's status as a veteran of the Revolutionary War is made clear by attributes, including knee breeches worn in the previous century, the portrait in military dress on the far wall, and the bust of George Washington behind him. The painting rewards close scrutiny, with such unexpected details as an apple and corncob interspersed with the clock, porcelains, lamps, and book on the mantelpiece, the tabletop still-life, and the adroit rendering of textiles and furniture. The glass on the print of Trumbull's Signing of the Declaration of Independence shows a crack, a symbol of the divisiveness of the political moment. Woodville may have seen this detail in a work of decisive political content in Düsseldorf, Workers before the Magistrateby Johann Peter Hasenclever, painted in 1848. 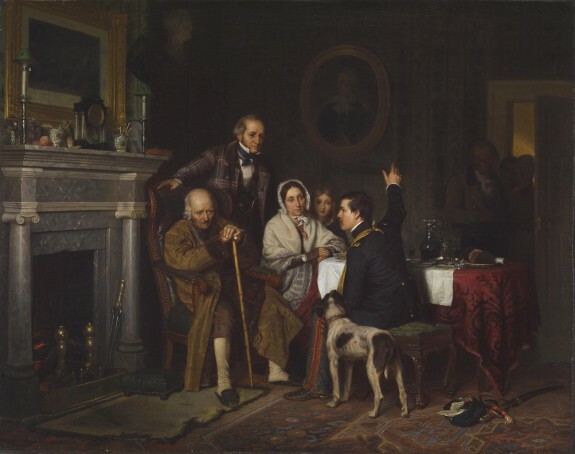 One of the puzzles posed by Old '76 and Young '48 is how the artist, living in Europe, acquired his knowledge of the specifics of the Mexican War uniform, in which shoulder straps indicated rank and stripes on trousers denoted different regiments, details that Woodville changed as he completed the painting. No one in his immediate family served in that war, though his friend Stedman Tilghman enlisted as a surgeon in 1846 and succumbed to the strain, dying in New Orleans two years later. Woodville may have studied illustrations in American newspapers or daguerreotypes. Clearly aware of the polarized opinion on this war in the United States, and having suffered a personal loss, the artist takes an ambiguous stance in the argument that is this work's central narrative. Richard Caton Woodville. Corcoran Gallery of Art, Washington; The Walters Art Gallery, Baltimore; Munson-Williams-Proctor Arts Institute- Museum of Art, Utica; High Museum of Art, Atlanta; Brooklyn Museum, Brooklyn. 1967-1968. The West as America. National Museum of American Art, Washington. 1991-1992. At Home with Art: Painting in American Interiors, 1784-1919. Katonah Museum of Art, Katonah. 1995. The American Artist as Painter and Draftsman. The Walters Art Museum, Baltimore. 2001. American Stories. The Metropolitan Museum of Art, New York; Los Angeles County Museum of Art, Los Angeles. 2009-2010. New Eyes on America: The Genius of Richard Caton Woodville. The Walters Art Museum, Baltimore; Mint Museum of Art Uptown, Charlotte. 2013. California Mexicana: Missions to Murals, 1820–1930. Laguna Art Museum, Laguna Beach. 2017-2018. Provenance American Art-Union Sale, New York, 1852; purchased by William H. Webb, New York, 1852. Acquired by George William Abell, Baltimore, before 1894; Mrs. Francis Theodore Homer [Jennie M. Abell], Baltimore; Mrs. Ferdinand C. Lee [Jane Palfrey Homer], Baltimore. Acquired by Mr. and Mrs. George Jenkins, Baltimore, November 12, 1954; purchased by Walters Art Museum, 1954.